In case you haven’t heard, the Chicago Cubs just won the World Series for the first time in 108 years, ending the longest championship drought of any professional American sports team. The team and city are celebrating with a rally and parade this afternoon, and it’s already a complete madhouse. Hundreds of Cubs fans lined up hours before the gates to the celebration even opened, just so they could be among the first to catch a glimpse of their historic baseball team. Now that the gates have opened, the drunken antics and bad decision-making have also started. 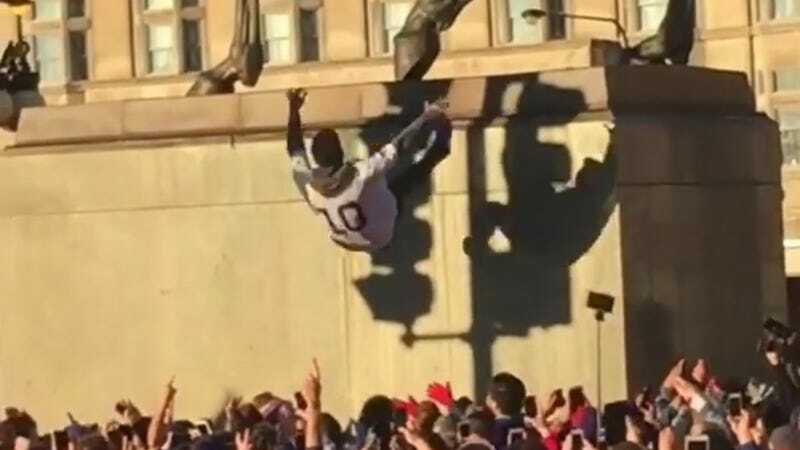 The victory has inspired some fans to start doing trust falls from a large, 18-foot statue sitting just outside of Grant Park where the team’s rally is taking place. Yikes.